-SG- The late Phil Irving (1903-1992) needs no introduction to the world of motor cycling. Apart from numerous technical articles published by Motor Cycling under the pen-name 'Slide-rule,' later combined in 'Tuning for Speed' (1948) he also spent the thirties and forties working as a designer for Velocette and HRD, with a short spell at AMC in 1942. He returned to his native Australia in 1949 although he continued to visit UK regularly for many years after that. Irving's short spell at AMC co-incided with Joe Craig's somewhat longer stint. He apparently got on well with Joe although he says that Joe was useless on the drawing board! One piece of information Joe provided though, was that during the thirties (exact period unspecified) Norton's racing department had sub-contracted many special parts to BSA, including jig-bored cam boxes and (I assume telescopic) fork stanchions, which were made from solid on gun-barrel boring plant. 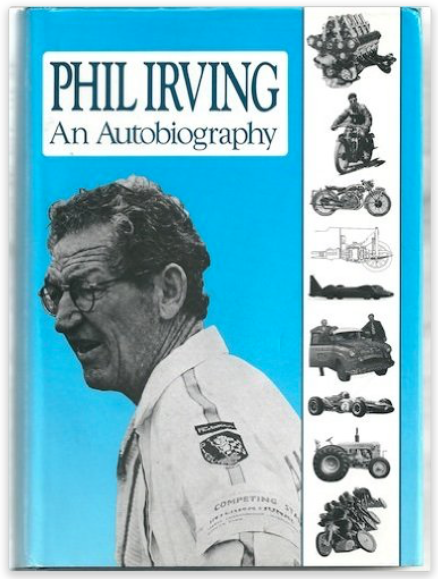 Reverting to the late twenties, Irving ran a motorcycle business with a friend for a couple of years - selling new and second-hand machines and carrying out repairs. One of his friends - a chap called Sid Gribble - had a Model 18 Norton which he found rather awkward, being very short in the leg, so fairly far-reaching efforts were made to remedy this in late 1927. To quote Irving ... "We moved the head lug back by a couple of inches, shortening the saddle tube and bending the top tube to suit. The rear forks were also modified and the engine was lowered so much that it only just cleared the ground with no air in the tyres! The saddle height was reduced to 22 inches and the wheel-base to 52 inches, the job entailing copious brazing with our monster blow-lamp. The finished article was probably the smallest Norton single ever made and while it could accommodate its very short-legged owner, anyone of normal size could not sit on it comfortably. Worse still, it steered abominably unless accelerating hard, which you can't go on doing indefinitely, so the result of our misguided effort was put away in a corner and eventually sold to someone in Mildura who harnessed it to a sidecar." 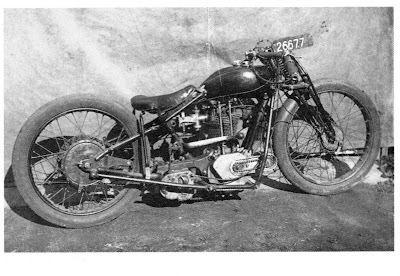 A shot of the modified bike is attached - it looks to be '25 -ish - and appears to have extra frame bracing tubes as well as a Binks Mousetrap carb. and a diminutive saddle tank. I wonder if it has survived!